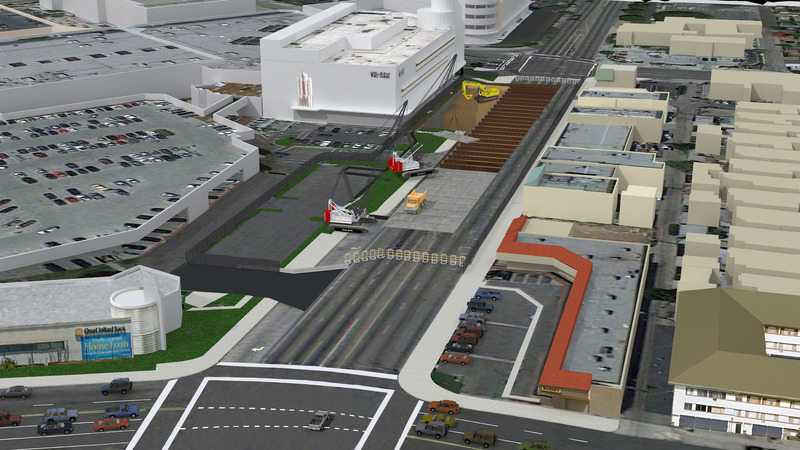 Utility relocation and steel pile installation on the Crenshaw/Vernon underground station will simultaneously take place during the street closure. 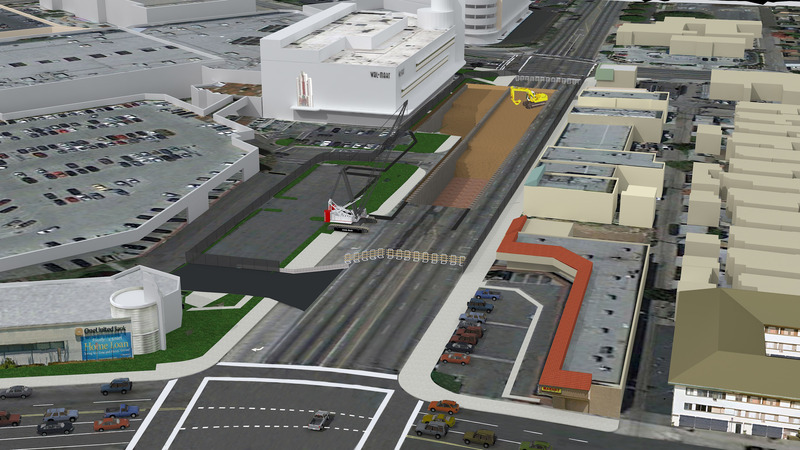 If you are planning to travel in this area [to visit the West Angeles Church of God in Christ, the Baldwin Hills Crenshaw Plaza or other businesses along the corridor,] plan ahead to avoid delays. 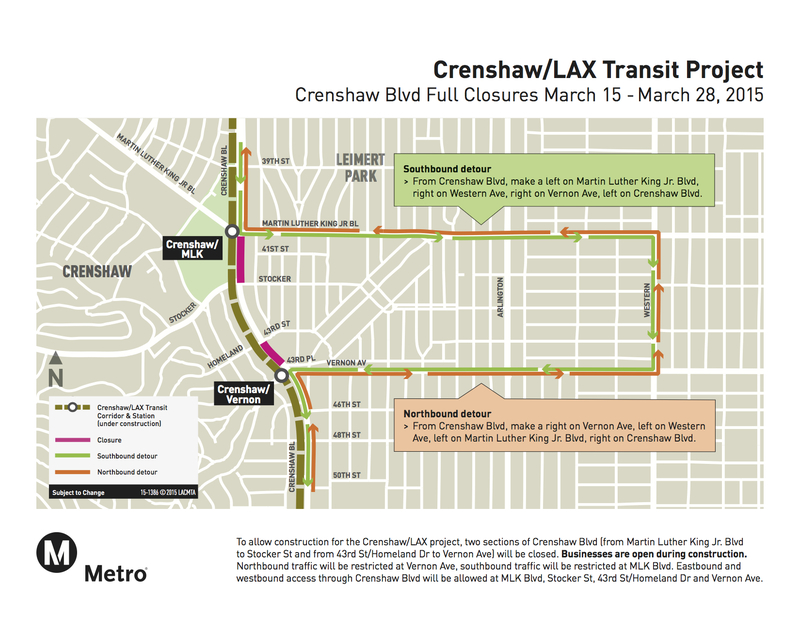 Although Crenshaw Boulevard will be closed, traffic will be able to cross Crenshaw Boulevard east and west-bound at Martin Luther King Jr. Boulevard, Stocker Street, 43rd Street and Vernon Avenue throughout the closure. If you are traveling south on Crenshaw Boulevard turn left at Martin Luther King Jr. Boulevard, turn right at Western Avenue, turn right at Vernon Avenue and then turn left at Crenshaw Boulevard. If you are traveling north on Crenshaw Boulevard turn right at Vernon Avenue, turn left at Western Avenue, turn left at Martin Luther King Jr. Boulevard and then turn right at Crenshaw Boulevard. Traffic control measures and signage will be implemented throughout the closure. Emergency and pedestrian access to area business will be maintained. Parking will continue to be available behind businesses within the closure area. Buses traveling north and south on Crenshaw Boulevard will be detoured but Metro has already posted signs to that effect in English and Spanish to notify passengers of the new bus stops.